Admission: Adults $8, Kids: $4, Families (4): $20 | Cultural performances. Hosted by MC Jess Abrahamson of KTTC. 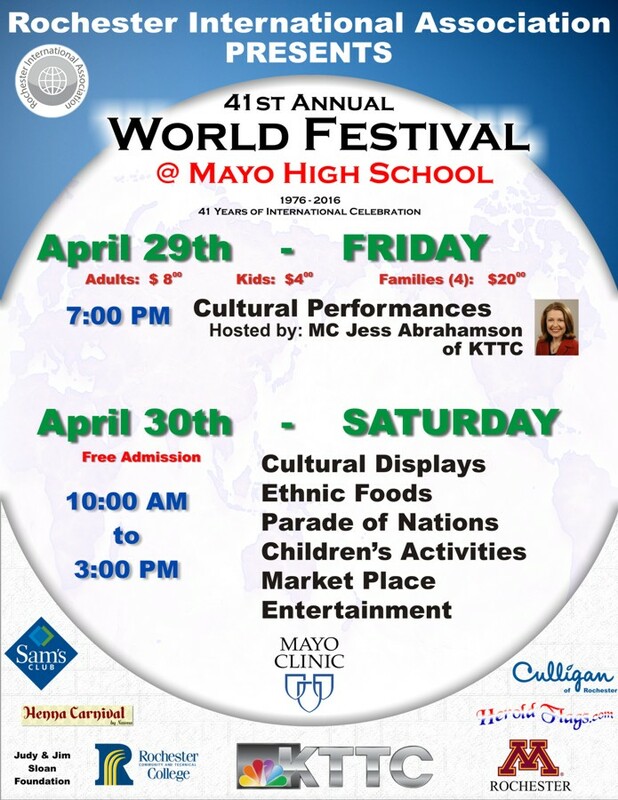 Free Admission | Cultural Displays, Ethnic Foods, Parade of Nations, Children’s Activities, Market Place, Entertainment. KTTC, Mayo Clinic, Herold Flags, Judy and Jim Sloan Foundation, RCTC, Sam’s Club, Culligan, U of M Rochester, Henna Carnival, Americorp, United Way, Southern Minnesota Initiative Foundation, Dolly Parton’s Imagination Library. Registration deadline is March 15. No registrations accepted after this date.